As I see it, there seems to be a recurring theme in the guitar manufacturing industry. A company creates a great signature product and then becomes envious of their competitors product, so they make an attempt to create a guitar similar to their competition's instrument, only to find out sales of the imitation are flat. The Fender Starcaster was an excellent instrument. 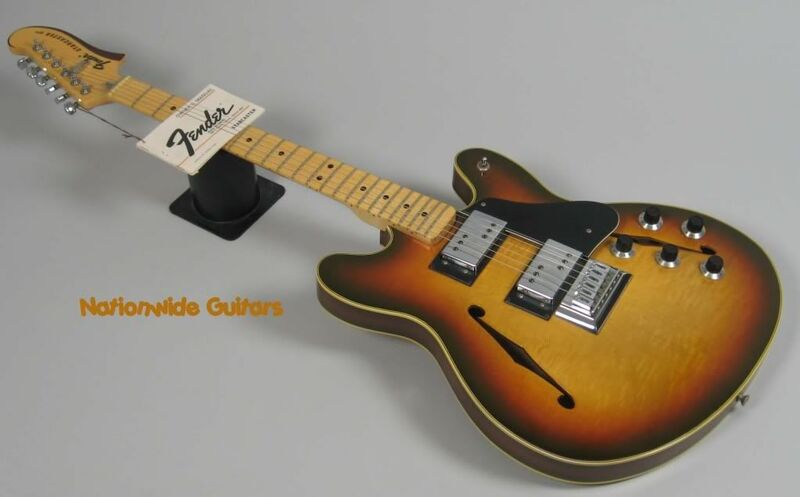 This was Fender’s attempt to move forward with a semi-hollowbody guitar, in a market dominated by Gibson. In the 1960’s through the 1970’s Gibson’s semi-hollowbody guitars, the ES-335 and ES-345 model guitars ruled the roost. There was a period of time the Les Paul lead the pack as the required solid body rock guitar. However through the 1950’ to the present, Fender Telecaster and Stratocaster are THE solid body guitars. 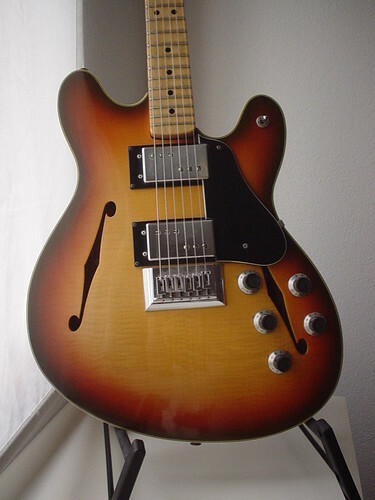 Fields sought to build a high quality semi-hollow body instrument during the CBS era. Gibson had already set the standard with their set neck design and Guild thin line guitars featured a set neck. 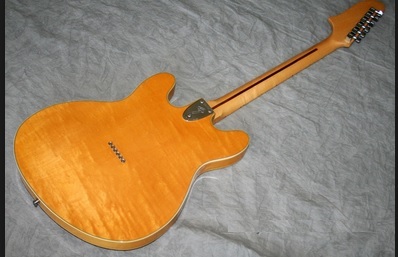 However Fender's Starcaster featured a bolt on neck with 3 bolts. This was not a popular feature. The Starcaster featured a master volume control and a unique string through the body bridge saddle/tailpiece. The guitar had volume and tone controls for each pickup and a toggle switch on the bottom uppper bout. The Starcaster production lasted from 1976 ending in 1980 (or 1982 depending upon sources.) Unfortunately the Starcaster was commercially unsuccessful. At the time guitarists envisioned Fender guitars as solid body, single coil pickup instruments and Gibson as hollow or semi-hollow instruments with humbucking pickups. The Starcasters headstock design was quite different from other Fender guitars. 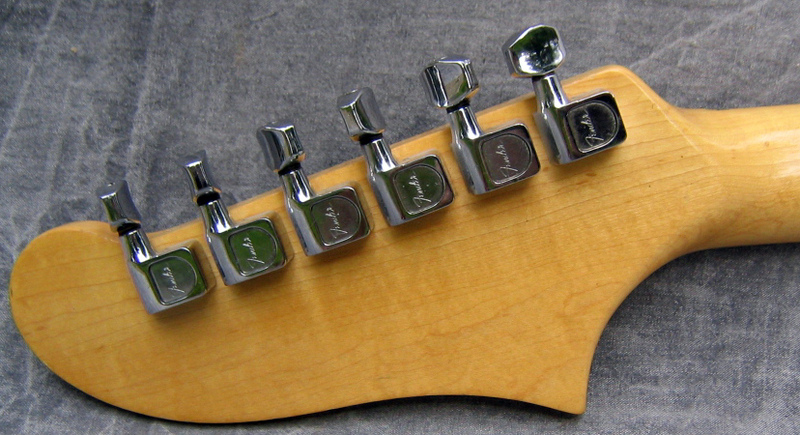 It retained the six-on-a-side tuning pegs, but the curve at the headstocks end pointed up instead of being rounded off. 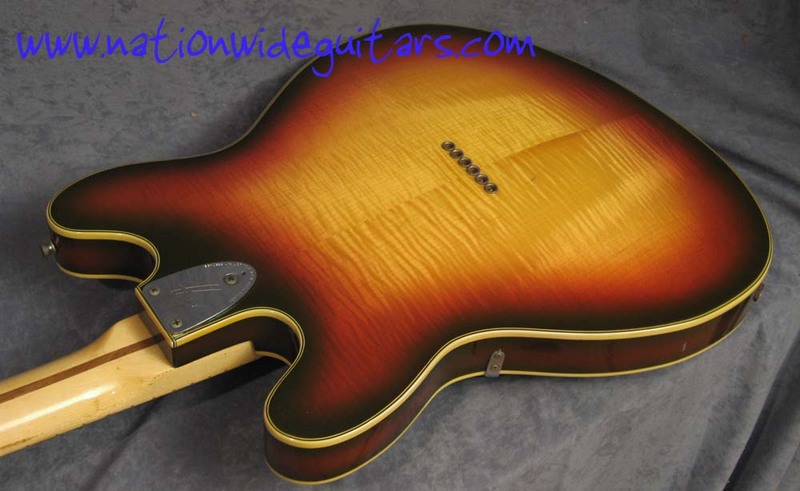 The headstocks bottom curve was painted to match the color of the guitar body. The body was asymmetrical. The fingerboard featured a maple fretboard. The controls consisted of volume and tone controls for each pickup and a master volume control. The Starcasters humbucking pickups were designed by Seth Lover and first appeared on Telecaster Customer and Thinline instruments. These pickups were known as Fender Wide Range Pickups. Two of these were mounted on each Starcaster. The Starcasters body, neck and fretboard were all made of maple. The 25.5" neck scale was typical of most Fender products. The bridge was fixed on the bodies top and the strings went through the body and the ball ends were held by grommets. 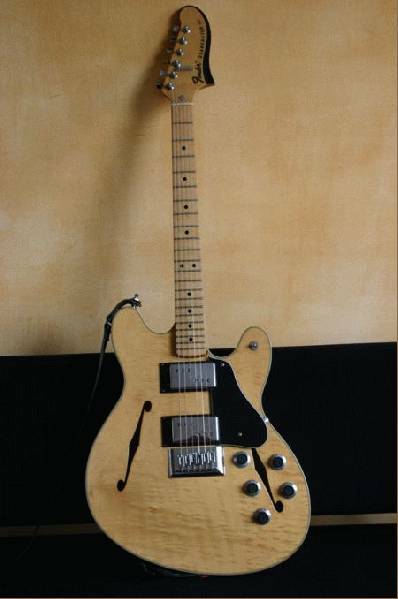 The color choices for the Starcaster were White, Natural (Blonde), Sunburst, Tobacco, Mocha Brown. Due to the guitars unpopularity when first sold, Starcasters are not considered to be high value collector instruments. However they were well designed players. Possibly Fender should have stuck to what they do better than anyone else and stick to making high quality solid body guitars. Who knows? The Starcaster name was revived recently for Fender's budget quality, Asian manufactured instruments sold at Wal-mart and other big box stores. In 2013, Fender reissued the Starcaster and the Coronado in both guitar and bass versions. The new models no longer have the string-through-body, but come with a trapeze tailpiece. The master volume control was eliminated on the new models. These guitars resemble Stratocasters and are distributed by Fender, but do not bear the Fender or Squier logo. The Starcaster body looks a bit offset eh?